The US Senate has failed to pass a bill approving the controversial Keystone XL oil pipeline. The Senate voted by 59-41 in favor of the bill, but this was one vote short of the 60 needed to pass it. The 1,179-mile pipeline would carry tar sands oil from Alberta, Canada, to Nebraska where it joins pipes running to Texas. Republicans maintained their majority in the House and gained control of the US Senate during mid-term elections on November 4. But the official start of the new Congress is not until early January. 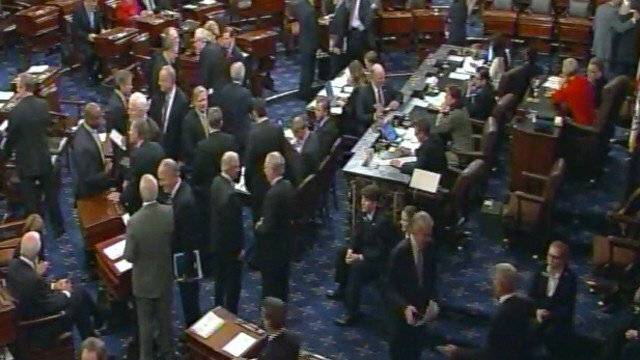 The bill failed to pass despite all 45 current Republican senators as well as 14 Democrats voting in favor. It is a privately financed project, with the cost of construction shared between TransCanada, an energy company based in Calgary, Alberta, and other oil shippers. A state department report raised no major environmental objections in February, but the final recommendation was delayed amid a court battle over the project in Nebraska. The state department is involved because the pipeline would cross an international border. The Keystone XL pipeline aims to carry some 830,000 barrels of heavy crude a day from the fields in Alberta to Nebraska. The oil would then be transported on existing pipes to refineries in Texas. The southern section of the project was finished last year. The bill passed easily in the House last week with a 252-161 vote, but it was not the first time the chamber had voted to approve the project. The bill’s sponsor, Louisiana Representative Bill Cassidy, is facing a run-off election against incumbent Democratic Senator Mary Landrieu for her seat. Mary Landrieu – among the pipeline’s Democratic supporters – successfully pushed the Senate to hold the vote on the measure on November 18 and urged backing for the measure.